This Black Cat concept art from Spider-Man 2 makes us sad that Felicia Hardy was cut from the film. 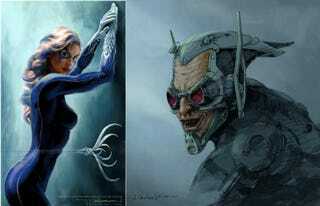 Plus see how the Green Goblin could have looked way creepier! Illustrator James Carson has released an early vision of Black Cat, and her slinky catsuit. He also has a ton of designs for Dr. Octopus' lab. And finally here's a collection of concept art of Sandman as a GIANT SAND CASTLE that he made for his daughter, out of his sand body. Which is the weirdest thing ever.